GPS technology in smartphones really opened the floodgates to better mobile marketing, and retailers have been keen to cash in. Pay close attention, and you'll notice a wide range of ads and promotions displayed on your device that appear to be informed by your location at that moment. Several marketing campaign types leverage GPS to provide better personalization, and improve audience targeting and filtering—but where indoor localization is concerned, GPS has its limits. It can accurately read which city block you're standing on, but when consumers are moving around within a retail space, GPS isn't very reliable. Retailers have a lot to gain from tracking the movements of consumers in their stores, and that means a different positioning solution needs to be deployed. An indoor positioning system, or IPS, is exactly the right tool in this case. While it improves upon GPS location accuracy, it adds a whole new layer of information that can quickly power an enhanced consumer experience. The primary value of IPS has to do with accuracy. GPS information is tracked by satellites spinning around the Earth. It's understandable that they wouldn't be able to track small movements of an individual inside a building. But IPS can, and it works in much the same way as GPS location tracking does—it just does it on a much smaller scale, typically deployed within a single in-store environment. Because shoppers are so much closer to the beacons or other tracking technology being used, it's easy for small movements to be tracked. Even positional changes of inches can be measured, and the implications of those small movements can be saved as data, which analytics tools can later process, according to Customer Think. For retailers, the potential insights are unprecedented. Instead of leaning on anecdotal information about the "typical in-store shopper," they can build comprehensive profiles of individual shoppers, as well as their larger consumer base. With that information in hand, marketers will have a field day. Behavioral data created by indoor localization solutions can drive or improve a wide range of campaigns while dramatically improving the in-store customer experience. For example, IPS could be used to deliver timely offers based on a shopper's location in a store and their browsing history. IPS can help deliver a discount for men's clothes to a shopper spending all of their time in the men's section of your store—or, if that shopper has lingered in front of a particular display for a men's suit, the offer can pertain to that specific item. These offers can be delivered through mobile apps. Brands can also offer rewards points based on the amount of time consumers spend in stores, or the amount of foot traffic they accumulate over the course of their visits. When shoppers head to the exit without making a purchase, retailers can try to coax out a conversion by offering a last-second deal that might make shoppers think twice. Meanwhile, IPS can improve non-digital efforts, as well, by informing changes in the shopper experience. This data may inspire rethinking product placement or store layout, for example. As Sixteen Nine points out, a comprehensive IPS system can incorporate a few different pieces of mobile technology. Beacons are great at powering analytics and connecting to mobile retail apps, but camera sensors are prime technology for mapping footfalls and tracking traffic in stores. Mobile device sensors can be powered by in-store Wi-Fi, and better LED lighting in stores can make cameras and other features more accurate and serviceable. Some of these technologies may already be installed in your store, while others will need to be integrated with your existing infrastructure. Whatever the case, make sure you give IPS a serious look. 1. 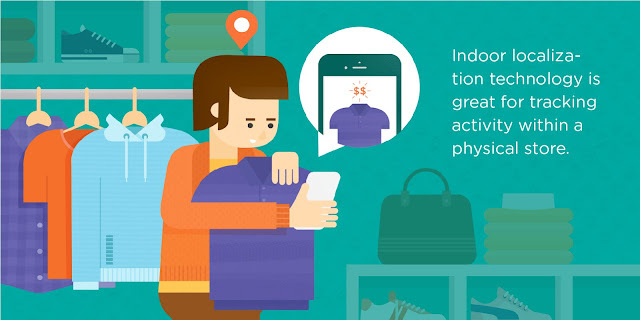 Indoor localization technology is better than GPS at tracking activity within a physical store. 2. Rich behavioral data can be used to drive better in-store marketing, such as offers for personalized deals based on browsing history. 3. Retailers should invest in a beaconing or other IPS technology solution that can track small movements within their stores, and ensure data-acquisition channels are in place to optimize the insights coming from this new layer of in-store tech.